Congratulations to Dr. Mary M. Dwyer, President & CEO of IES Abroad on her PIEoneer Award for Outstanding Contribution to the Industry! This award recognizes an individual who has helped evolve or shape the international education sector, and we couldn’t be more excited to celebrate Dr. Dwyer and her accomplishments and contributions to the field. 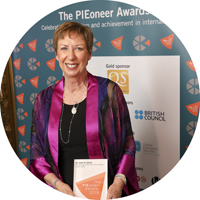 The PIEoneer Awards are hosted by The PIE News, an independent media organization focusing on leaders and innovators in international education. The PIE News selected a shortlist of 65 finalists – 26 in Europe, 13 from North America, 10 from Australasia, seven in Asia, and one each from Africa and the Middle East – altogether representing 19 different countries. A distinguished judging panel from across the field of international education selected the winners of the 14 different award categories. 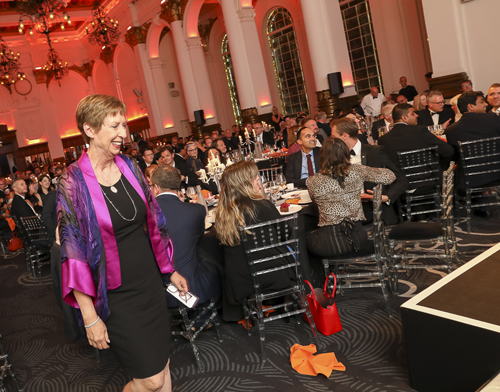 All winners were announced at an awards ceremony in London on September 7th. 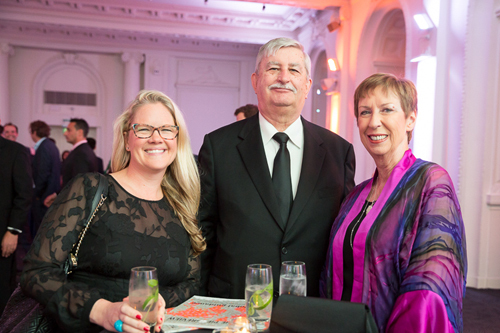 Dr. Dwyer was accompanied by Amy Ruhter McMillan, IES Abroad Senior Associate Vice President, Marketing and John Ockey, Center Director of IES Abroad London. Dr. Dwyer has significantly contributed to the growth and advancement of international education through her leadership, good practice, collaboration, and research. She is one of the first female CEOs of a study abroad provider, and she has made considerable efforts in supporting women in the study abroad field. Dr. Dwyer continuously strives to provide increased access to innovative, high-quality academic study abroad experiences for our students, and her most recent effort is reflected in the merger between IES Abroad and The Study Abroad Foundation (SAF). She has taken a multi-faceted approach to making quality study abroad programming accessible to college students around the world including expanding financial aid and scholarships and establishing the Initiative to Diversify Education Abroad. Beyond her work at IES Abroad, Dr. Dwyer has consulted extensively during her career and been called upon by an array of U.S. and international organizations across 20 developed and emerging countries, including the World Health Organization (WHO), Global Ministries of health and education, and the W. K. Kellogg Foundation. We are thankful for the more than 20 years Dr. Dwyer has dedicated to our organization, and look forward to many more years of her leadership. The IES Abroad Study Abroad Film Festival was also shortlisted for the Marketing Campaign of the Year category. Congratulations to all of the 2018 PIEoneer Award winners and finalists. We’re grateful to be recognized as individuals and as an organization through numerous awards. Learn more about what sets us apart. Photos provided by The PIE News.